Avoid congestion associated with the busy return to school period and TRAVEL FREE before 7am on all Hobart urban Metro services from Tuesday 29 January to Friday 22 February 2019. Did you know each bus has the potential to take up to 60 cars off the road? Join us to experience a commute without the hassles of traffic congestion, concentrating on the busy road, or finding and paying for a parking space. When you switch to travelling on an early morning bus, you can enjoy a more comfortable on board experience while contributing to reduced peak hour congestion. Spend your commute relaxing, being productive, or catching up on entertainment – all for free. While not everyone’s travel needs are flexible, reducing congestion will benefit both Metro’s service reliability and Hobart’s road network. From public transport to flexible working hours, active transport, or carpooling – try something different, even one day a week! Why not Park and Ride if you live outside the urban area? For more information call 13 22 01. 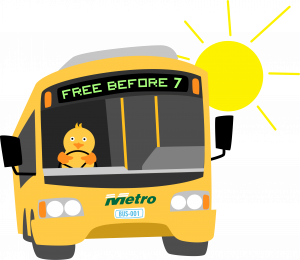 Free travel applies within the Hobart urban area when you board a bus scheduled to depart your stop prior to 7am on business days. If a service is scheduled on the timetable to arrive at your stop before (or at) 7am and arrives after 7am, you will still be allowed to board for free. Standard fares apply after 7am, on weekends, public holidays and for non-urban travel. This promotion is not currently offered in the Launceston and Burnie networks and non-urban areas of Hobart.